240 p. illustrated 33 cm. Atlas of the world&apos;s religions. 100 ME:PersonalName 1_ $a Personal name Smart, Ninian, editor. 245 Title 00 $a Title Atlas of the world&apos;s religions. 300 Physical Desc $a Extent 240 p.
500 General Note $a General note Includes glossary and index. 541 Acq Source Note __ $d Date of acquisition 2000/10/01. 650 Subj:Topic 0 $a Topical term Religions. 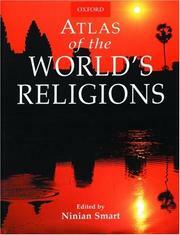 650 Subj:Topic 0 $a Topical term Atlases--religions.